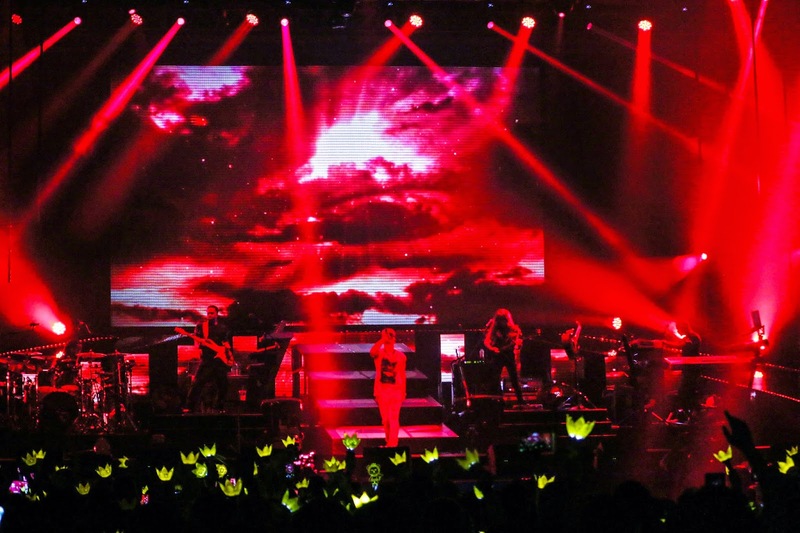 Kuala Lumpur, February 2015 – BIGBANG’s member TAEYANG has had his Taeyang “RISE” World Tour Concert in Malaysia 2015 held at Stadium Negara a few days ago. 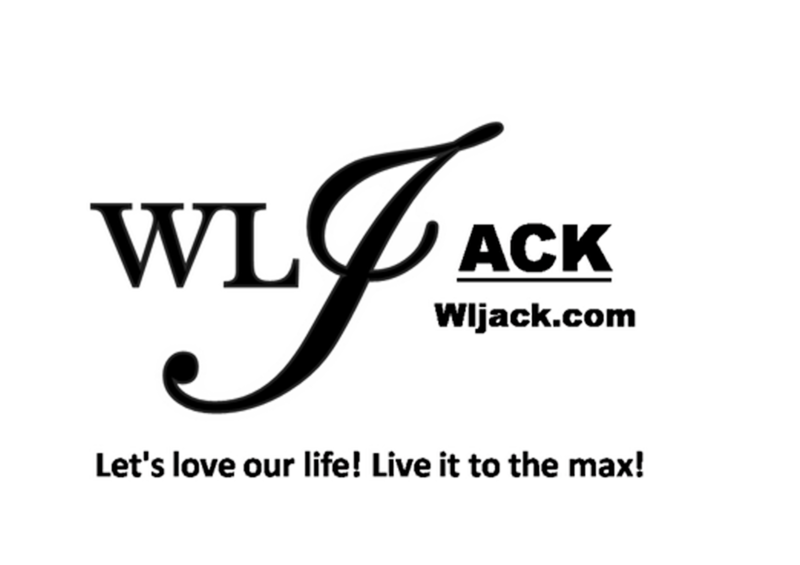 Our team from wljack.com and loong-updates.blogspot.com have been given a golden opportunity to do a coverage on the event. 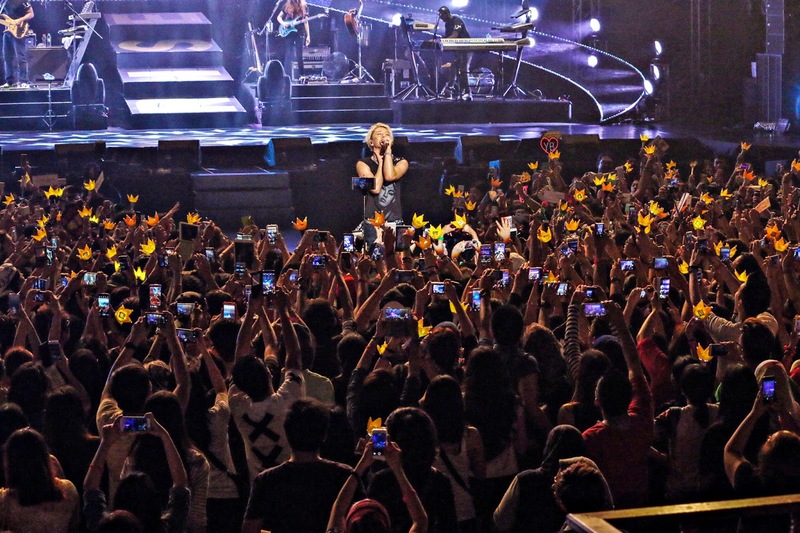 The venue was crowded with many VIPs and TAEYANG’s fans. At around 6.45pm, a video presentation was shown and without much delay, TAEYANG came on stage and started to dance and sing on stage. 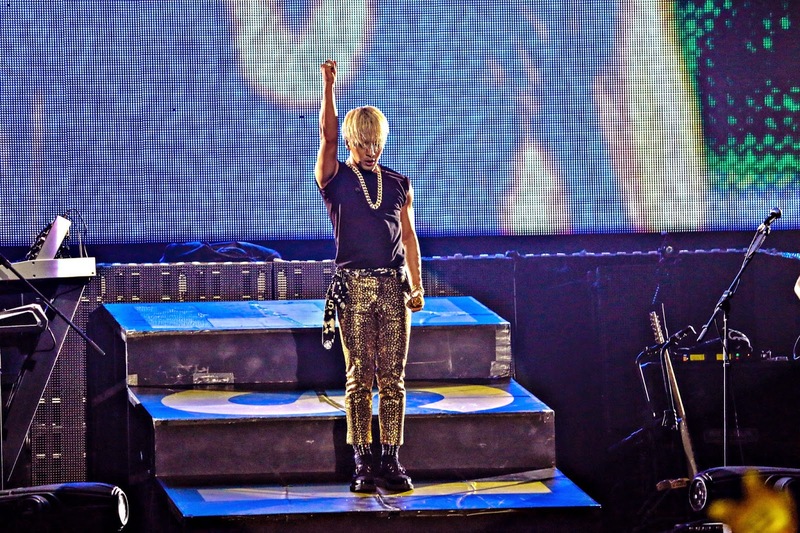 All of the fans screamed and cheered in joy as they saw their favourite idol stood on stage. Special Filter and Effects on the LIVE Video! During the show, the LIVE video shown on the screens were featured in Special Filter Effects. Some of the filters are really cool and you can see TAEYANG in a unique and cool infrared effect. However, the screen effects is just an additional seasoning to the show. The best part of the show is still TAEYANG himself and I am sure quite a number of the fans put their focus onto TAEYANG only without paying much attention to the special filter effects on the screened video. The Walkway Draws TAEYANG Closer To The Fans! As mentioned in my previous post, the stage walkway was divided into various areas. This design is really great because it allows TAEYANG to reach his fans more easily. 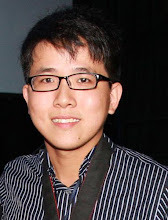 In fact, he has jumped right from an area to another area (especially the middle walkway area) effortlessly and sang in front of his fans at a very close-up distance. I am sure many fans were really delighted with this layout. Besides showcasing his singing and dancing talent, TAEYANG has also performed on stage with a beautifully crafted Keyboard (or Organ piano?) on stage. It was a spectacular performance by him and he was indeed very talented. Lucky Fans Went on Stage! 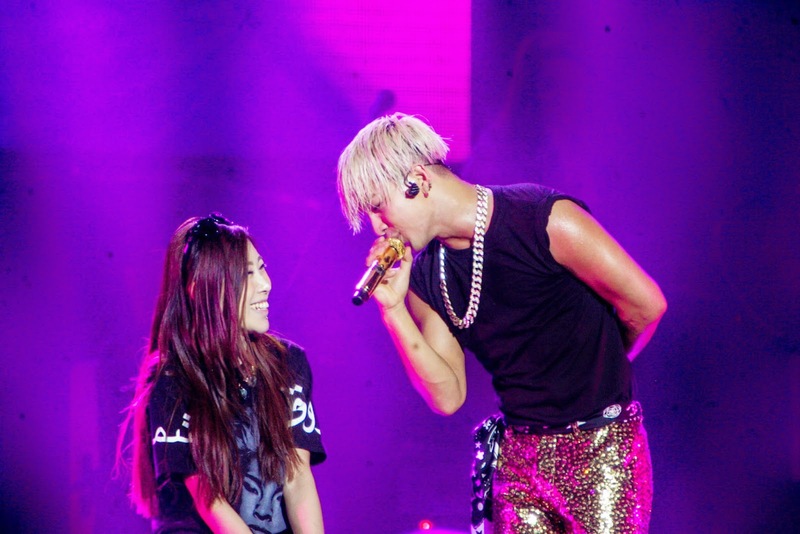 There was a segment of the show whereby TAEYANG has invited a lucky female fans on stage. He sang beside of her during that session. 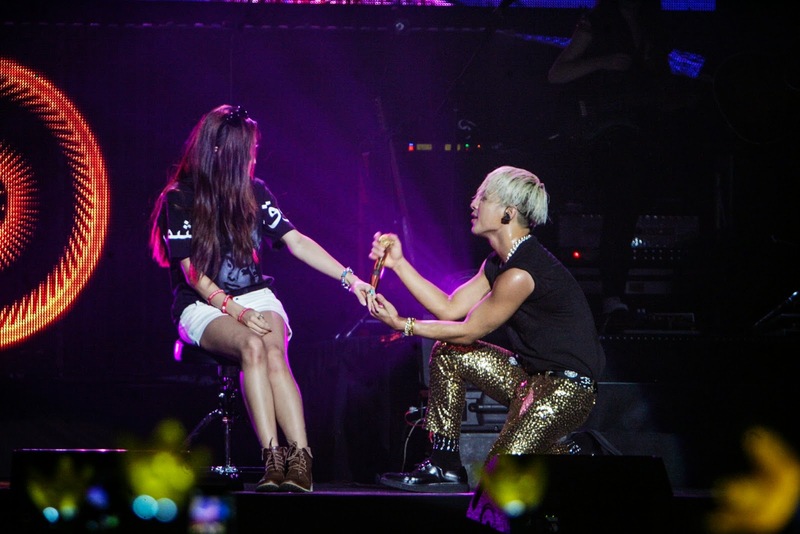 In addition, he even asked the girl, “Can I be your boyfriend tonight?” I am sure many of the fans were envy of the lucky female fans that night. Burning Introduction! Eyes, Nose, Lips! Without any doubt, Eyes, Nose, Lips is the one of the most significant masterpiece from TAEYANG. Many of the fans attended the show with the hope to listen to him singing this song LIVE. Prior to his performance of this song, there was a short video presentation. There was an explosion in the video which then followed by his appearance on stage singing Eyes, Nose, Lips. Many of the fans were singing along with him and I could see many audiences took out their smartphones or tablets to record this part of the show. 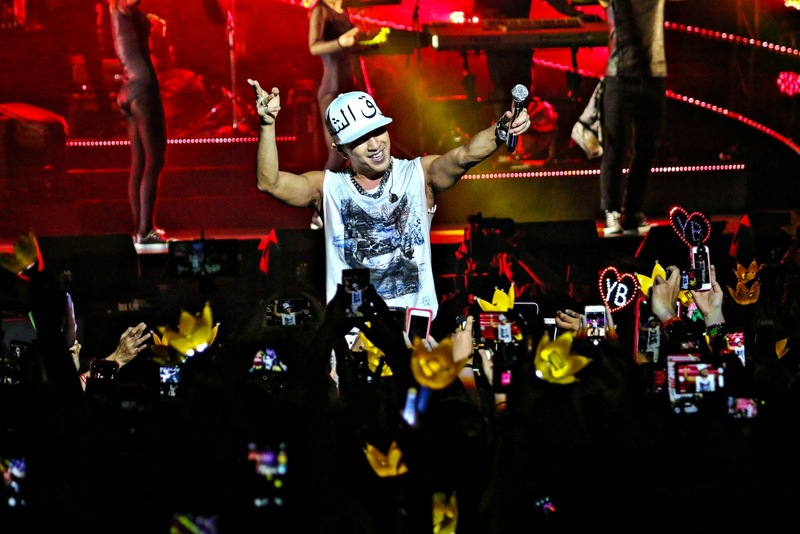 After a series of singing on stage, TAEYANG has given some speech and interacted with the fans. He said that he took approximately 4 years to make his album “RISE”. 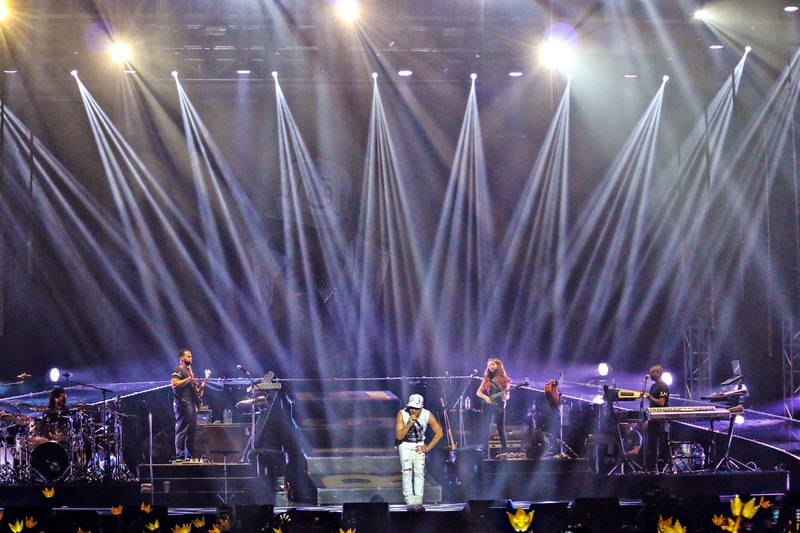 “All I was waiting for was..to meet you guys on this stage.” Said TAEYANG. He even funnily added that he was thinking for this moment to come true even when he was in the bathroom and when he was doing “business”. 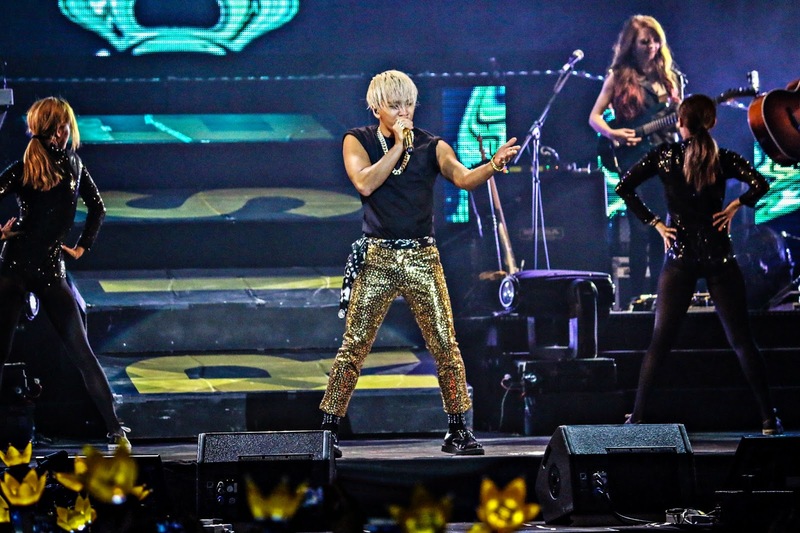 During the next peak of the show, TAEYANG asked the crowd whether they want to see G.D. The crowd were so excited and screamed “Yes”. 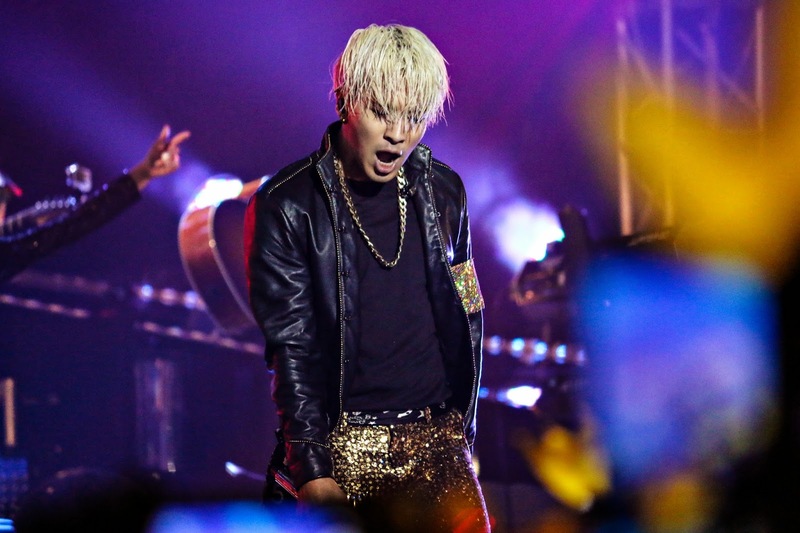 I believed many of the fans thought that G. Dragon would really appear as guest. G.Dragon did appeared, but in a video shown on screen. 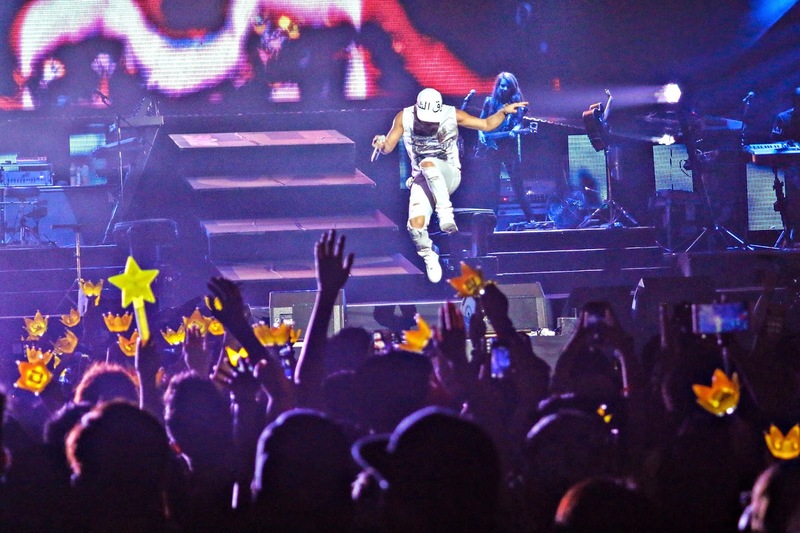 Then TAEYANG sang “Ringa Linga”, another fans’ favourite. He also performed “Good Boy” on stage. It has turned the crowd wild and all hyped up during this session of the show. After that, the show proceeded with another interaction session. This time TAEYANG has spoken many Bahasa Malaysia phrases such as “Apa khabar?”, “Saya cinta kamu.”, “Terima Kasih” and etc. It’s pleasant to see how he could say out those words so accurately. Taeyang was quite hilarious during this part of the show. There was a hiccup during one of the lucky draw as he was unsure on where should the fans assemble after the show to collect the prize. The lucky fans get to walk away with his new sneakers and hat. On top of the hat, it’s some Jawi words meaning, “Sun” and “Rise”. A Treat for the VIP! BIGBANG songs! Besides his own song, TAEYANG also dropped a good treat for the diehard VIP as he sang some songs from BIGBANG including BAD BOY and FANTASTIC BABY! Yeah, it’s really a fantastic reminisce session for all the VIPs. Encore! Eyes,Nose, Lips 2nd Time! 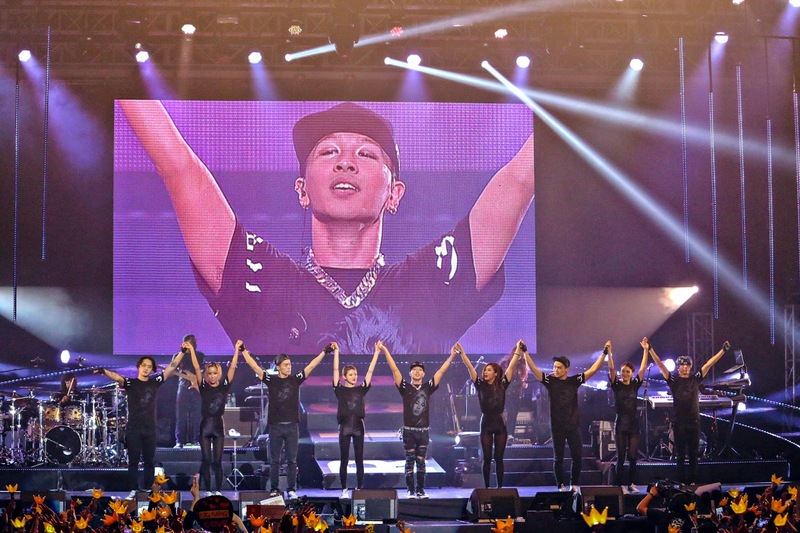 After he sang BIGBANG’s song, he went to the centre of the stage and seemingly rolled down from the screen indicating that it was the finale of the show. However, he suddenly came back from the lowered part of the centre stage after the fans shouted encore for him. He came back on stage to sing “Body” followed by “Eyes, Nose,Lips” for the 2nd time. It was a really great finale! That’s all for the coverage of the show. *Credit to the official photographer for the photos because media members were not allowed to take photo during the show.